Since the past week hadn’t been so great, I decided to wear a “lucky” outfit for the race – the white shorts and white/light blue Road Runner Sports tank top that I wore at the Expedition Everest Challenge. I also wore my “princess” bondiband instead of the plain black one that I’ve been favoring lately. For a little extra energy, I tried the espresso flavored GU with 2x the amount of caffeine in most of the other GUs. The taste of the GU didn’t really appeal to me, but then I’m not really a coffee drinker. I think it did give me an extra kick of energy though. There weren’t that many people at the race. About 150 between the 8k run, 8k walk, and 2 mile fun run. Although the park facilities were nice – lots of shaded seating, real bathrooms, convenient parking – the course itself wasn’t that scenic or interesting. It was an out and back in sort of a J shape. There were a couple small hills but it was mostly flat. I debated whether or not to wear my Garmin because I wanted to take it easy and not worry about my pace. In the end I did wear it, but mostly didn’t look at it much at all. I also wore my iPod shuffle because I figured I might need a distraction. I had my iPod at the Havasu Half but never actually used it, so this was the first time I listened to my iPod during a running race. I tried to run the cord through the back of my top, but the earbuds kept falling out. About a mile in I finally got annoyed and moved the cord back to the front. I liked having my favorite podcasters keep me company during the race. As part of my plan to take it easy, I took a short 30-45 second walk break after every mile. I don’t know if it helped or not. It was nice to take a short rest from running, but it was also hard to start running again. It was hot this morning and there wasn’t really any shade on the course so I stopped for water at each station. I thought I had the running and drinking thing figured out but I wasn’t coordinated enough today, which meant an extra walk break at the 2.5 mile/4k water station/turnaround point. I was surprised that my time was exactly 30:00 at the 3 mile mark, even with the walk breaks. After that my pace slowed for the last 2 miles. It didn’t help that I had a couple foot problems. I went with my Adidas for the race because of the better cushioning, but around 2 miles in I could feel the blisters forming under my arches. It’s beginning to seem like I can’t wear the Adidas for anything longer than a 5k. Also with about 1/2 a mile to go, my right foot started to get tingly, then eventually numb. I wasn’t feeling tired, but with the numbness in my foot it was getting uncomfortable to run. I was so close to the finish line that I kept running to the finish. No final sprint today though. The unique aspect of this race was the way door prizes were handled. After crossing the finish line, everybody received a playing card. Then during the giveaway, cards were drawn one at a time from another deck, for example the five of spades. Everyone who had a five of spades came up and drew another card with the high card winning the prize. The awards ceremony was before the door prize giveaway. My pace was 10:20 according to my Garmin and I wasn’t expecting to win anything at all because usually there are a lot of fast runners in my age group at ARR events. I was so shocked when my name was called for third place. I truly believed that there must have only been three people in my age group at the race. But according to the race results, I was third out of nine! That’s pretty freaking amazing when I wasn’t even trying my hardest today. Yay for small local races and people who decided to sleep in or spend time with their mothers instead of coming to the race. Getting an age group award must have used up all my luck for the day because my card was never drawn during the giveaway. There were some pretty awesome prizes, including two $100 gift certificates for Buca di Beppo. Personally, I was hoping for the $20 at Sprouts or $25 at Texas Roadhouse. Congratulations on placing; that’s awesome! 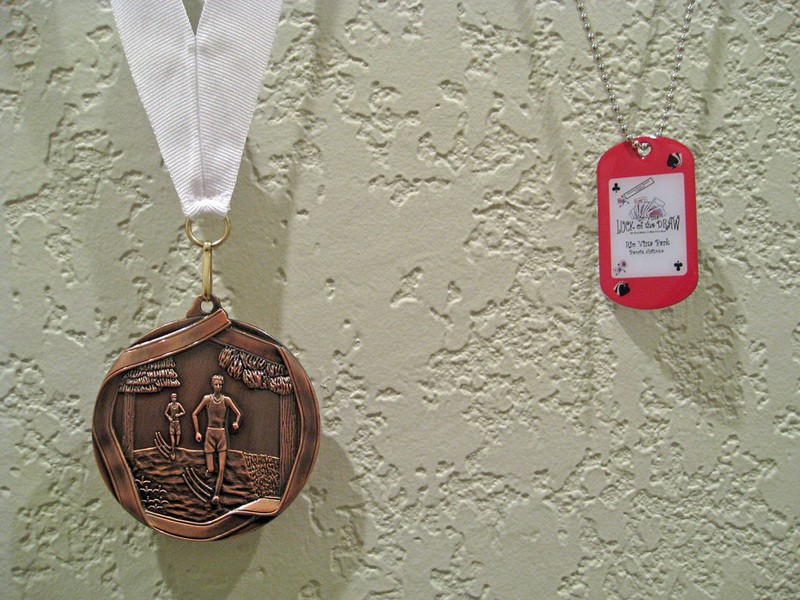 Now you have a shiny medal plus the…dog tag, haha. Maybe try BodyGlide on your feet? Now that it’s getting warmer, I’m getting more callouses and blisters on my feet.